Our tents make indoor gardening easy. Let you control the climate and lighting so you can safely and easily grow your plant in any place and any time. 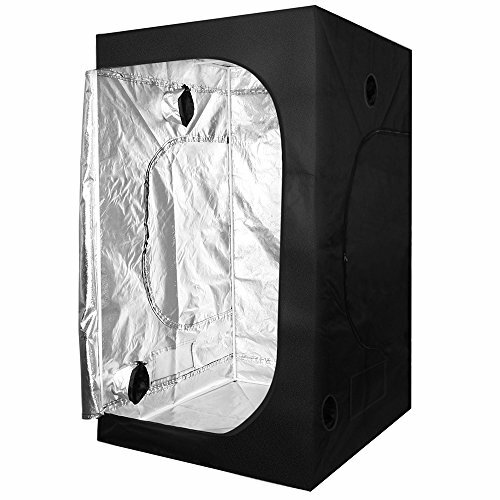 Because of high quality reflective interior lining of the grow tent, it can effectively protects strong sunlight from shining on plants so that plants are able to grow perfectly. Plus multiple intake/exhaust ports and a removable reflective waterproof floor pan, those allows you to set up your plants and growing equipment with ease. It will be worthy of your best choice to grow your plant!! -Free and non-toxic material is harmless for plant and environment. -Rectangle mesh window keeps away dust and insects. -Built-in Zippers and Velcro are easy to be setup and taken down. Size: 40" X 40" X 80"
PACKAGE INCLUDE: A 40x40x80 inch grow tent, 1x Water-Resistant removable floor, 2x filter straps and 1x user manual. HIGH QUALITY- Perfect for indoor plant growing with top quality: the 600D material is tear proof and double stitched for perfect light blocking. Thick tent material reinforced by the metal poles ensures security and stability, also keeps your grows contained and prevents odors from leaking out, stops pests from getting in. HIGHT BENEFIT- Our Kingrow grow tent blocks all light from escaping. On the interior, over 95% reflective mylar interior returns up to 92-97% of your grow light bulbs' light back to your plants and herbs. Increase your grows without adding to your energy bill! EASY TO INSTALL- Ergonomic and easy to assemble, there is no need tools, just make sure all the rubber feet are going the same direction. Extra canvas floor tray holds water for 3 days as a test with no leaks. OUR WARRANTY- 2-year warranty!!! If your grow tent has any issues, please contact us, we are at your service always. If you have any questions about this product by KinGrow, contact us by completing and submitting the form below. If you are looking for a specif part number, please include it with your message.